The “Zayed 2” joint military exercise between UAE Armed Forces and their Egyptian counterparts has continued its activities in the UAE, with the participation of armed forces units from both countries. 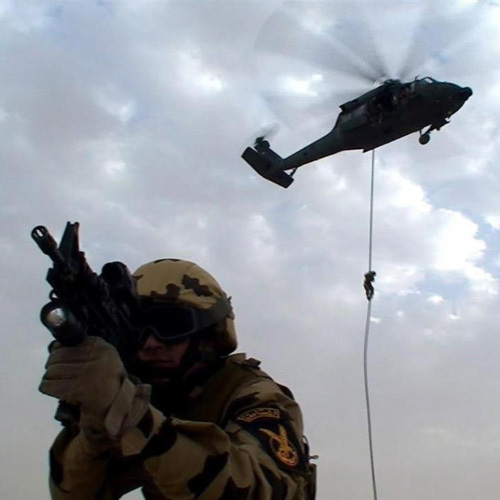 The training includes a series of joint military drills as part of a unified strategy to strengthen military co-operation between UAE and Egyptian armed forces, in order to unify joint operations and best training method, to improve armed forces’ combat ability to keep up with the modern era. The joint training includes executing many joint drills such as live ammunition training, raids and ambushes, while the air forces will execute air sorties on formations of fighter planes with the goal of achieving full air superiority in the operational theatre, by destroying vital targets, and understand leadership and control centers. The marine forces will execute landing operations, by advancing marine units and taking over beaches to achieve control. The “Zayed 2” joint military training, whose activities will conclude at the end of the month, includes a series of joint training sessions between the UAE and Egypt as part of their joint military co-operation, with the aim of training in the planning, execution and management of joint military operations, and launching unified procedures between the different participating forces. The UAE Armed Forces have worked carefully to execute such joint training with the goal of sharpening its combat skills and abilities, out of the constant desire of the General Command of the Armed Forces to elevate the level of performance, ability and teamwork based on a clear strategy, with the goal of increasing the general level and combat readiness of the UAE Armed Forces, to deal with modern machines and weapons. The Emirati-Egyptian combat training highlights that Gulf Arab countries and other fraternal Arab countries are able to stand up to any attempts of tampering with the security and stability of the region and that Arab military power is capable of striking with an iron fist against anyone who tries to violate regional and Arab security. The UAE has managed to build an army with combat capabilities that can execute military tasks with discipline and professionalism, and strengthen its capability. The UAE desires to provide all means of constant development for its armed forces and to raise its readiness and total preparedness.